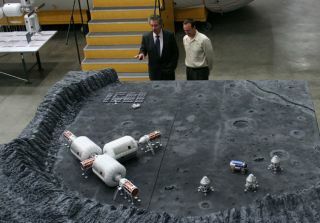 Space entrepreneur Robert Bigelow (left) discusses layout plans of the company's lunar base with Eric Haakonstad, one of the Bigelow Aerospace lead engineers. After launching two prototype space stationsinto orbit, space entrepreneur and pioneer Robert Bigelow is now setting hissights a bit higher. His latest vision: A quick-deploy moon base capable ofhousing up to 18 astronauts in inflatable modules on the lunar surface. The base itself would be fabricated in space, with considerationbeing given to crewmembers piloting the entire base directly onto the moon'ssurface. Bigelow founded Bigelow Aerospace in 1999,headquartered in Las Vegas, Nevada, drawing upon his construction, real estate,and hotel know-how to pioneer the use of expandable space structures. To datehe has dedicated over $180 million to his visionary quest. Two prototype space modules built by BigelowAerospace are now circuiting the Earth. Lofted in July 2006 and in June 2007,respectively, the company's Genesis 1 and Genesis 2 expandable modulesserved as forerunners to ever-larger and human-rated space structures. Bigelow's moon visions come at a time whenNASA is overhauling its plans for human spaceflight and planning to depend moreon commercial space companies for future hardware and spacecraft. On Thursday, U.S. President Barack Obama isexpected to announce the revival of NASA'scancelled Orion spacecraft to serve as a crew escape ship for the InternationalSpace Station, as well as guidelines for a heavy-lift rocket capable oflaunching heavy payloads into space. "We want to go to the moon . . . and theexpandable habitats are a good example of an enabling technology that will beleveraged to bring this vision to fruition," said Michael Gold, Directorof Washington, D.C. Operations & Business Growth for Bigelow Aerospace,LLC, based in Chevy Chase, Md. "Our goal has always been beyond low Earthorbit." Gold said that Bigelow Aerospace has beenaggressively establishing an international consortium of what the group termsas "sovereign clients" — along with hammering out the financial andlegal structure, he said, for such partnerships to blossom, first in low Earthorbit and then beyond. "We need to make low-Earth orbit workfirst before we go beyond . . . but I believe we will," Gold told SPACE.com. "Oncewe've established a robust infrastructure in Earth orbit, created the economiesof scale necessary to produce facilities in low Earth orbit . . . at that point, we'vereally enabled ourselves to look at a variety of options." Bigelow Aerospace has taken a hard look athow their habitats could function on the lunar surface, Gold said. "Webelieve our expandable habitat technology will be a critical piece of buildinga presence on the moon," he added. The testing of expandable habitatsin Earth orbit is key, Bigelow said. "The concept has always been to create genericenvelopes . . . for use as habitats, depots, storage warehouse facilities and giantlaboratories too," he added. There is "on-going discussion"about use of a Bigelow Aerospace-supplied module attached to the InternationalSpace Station, Bigelow said. Furthermore, Bigelow Aerospace is partneredwith Boeing for Commercial Crew Development (CCDev) — a commercially managedsystem that could be used to transport astronauts to and from the InternationalSpace Station, Bigelow Aerospace's Orbital Space Complex, and other potentialdestinations in low Earth orbit. But Bigelow and his team are sketching outarchitectures to also put their structures in the Lagrangian Point L1 — partwaybetween the moon and the Earth — and also used as depots for outboundexpeditions to Mars. "We think it's all very doable,"Bigelow said. The company is pressing forward on athree-person Sundancer module and the larger BA-330, a unit that offers 330cubic meters of leasable internal volume for a crew of six. But space is big, and so too are Bigelow'sideas. Given a NASA go-ahead to work on a superheavy lifter, much larger habitats are on the drawing boards, Bigelow said, "andthe volumes that we can launch are absolutely gigantic." Bigelow Aerospaceenvisions expandable habitats offering 2,100 cubic meters of volume —nearly twice the capacity available on the International Space Station — whileanother plan sketches out use of a super-jumbo structure providing 3,240 cubicmeters of volume. For the moon base, three BA 330s, along withtopped off propulsion tanks and power units, could be joined together and thenmigrated from either L1 or lunar orbit and flown to a pre-selected lunar spot. "The vessels are configured to beindependent of each other, to be self-sustaining," Bigelow said. "Intheory, you might have 12 people occupying the lunar station . . . which couldactually handle 18 people. But I'm a huge fan of margins. The larger the marginthe better I like it." The expandable systems are extremely tough,able to sit down on any kind of surface, Bigelow explained. "We wouldreinforce everything, the intersections where the spacecrafts come together, sothey would be able to accommodate an uneven surface." Nearby the landed base, a solar array fieldwould be deployed. Bigelow said that he's spent a good deal ofhis life in construction, putting together things for some 40 years. "And anybody that's done thatunderstands that a lot of things can go wrong. And they go wrong all the time.So you want to absolutely minimize logistics," Bigelow advised. It'scrucial that integrating activity be minimized, he said, be it on the lunar or Martiansurface. "All this is step by step taking us onthe way to Mars. The moon is a great practice ground," Bigelow concluded. "Themoon is a very valuable asset for a lot of reasons." Greatest ApolloHoaxes: Did We Really Land On the Moon? Leonard David has been reporting on the spaceindustry for more than five decades. He is past editor-in-chief of the NationalSpace Society's Ad Astra and Space World magazines and has written forSPACE.com since 1999.